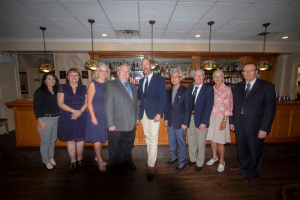 Bruce T. Peterson, Seabrook Educational and Cultural Center (SECC) present and Upper Deerfield Township Committeeman was honored for his exception service by SECC and Seabrook Japanese American Citizens League (JACL) at their annual 2018 Joint Volunteer Appreciation Dinner on September 12 at Esposito’s Maplewood III in Vineland. 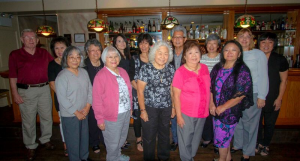 Together, Fuyuume and Peterson partnered in the governance of SECC, with Peterson assuming the role of president upon the passing of SECC co-founder, Ellen Nakamura, but in actuality Peterson functioned as an honorary chairman of SECC from its inception, many years prior to the opening of the Center in 1994. Peterson, was honored for his noted service as president from 2000 through 2018, during time of transition and growth. 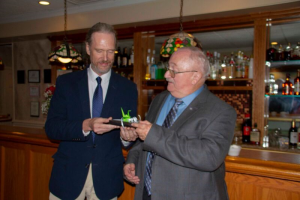 The presentation was made by incoming president, John M. Seabrook, Jr. of an inscribed pen and pencil set created for Peterson by Fred McFarland. JACL President, Michael Asada, also announced a contribution in Peterson’s name to Cumberland County Regional Animal Shelter. Upper Deerfield Township Deputy Mayor John “Terry” O’Neill started the program with words of greeting and appreciation from Mayor James Crilley. O’Neill and Seabrook recognized the volunteers who operate the Center, their dedication and continued service of sharing the unique history of Seabrook, a melting pot where people of different races and heritages were given an opportunity for a new start in life at Seabrook Farms.